In a way, the government shutdown couldn't have come at a more opportune moment. There had been noises overseas, troubling indications that had gone on for some time beforehand. The government shutdown had the practical effect of stringing along US decoupling a little bit longer at least in its narrative format. 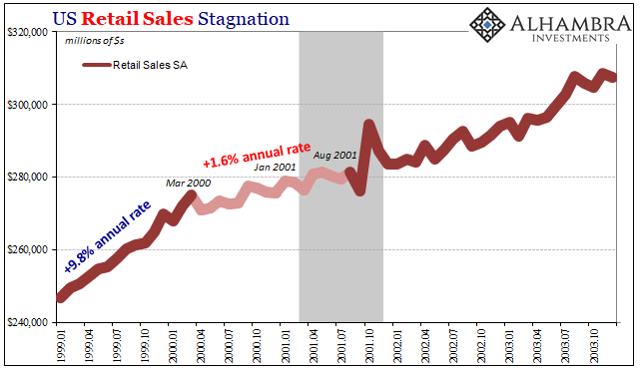 Now that decoupling has been shown once more to be a silly idea, the window shifts toward globally synchronized downturn. In a way, the government shutdown couldn't have come at a more opportune moment. As workers all throughout the sprawling bureaucracy were furloughed, markets had run into chaos. Even the seemingly invincible stock market was pummeled, a technical bear market emerged on Wall Street as people began to really consider increasingly loud economic risks. 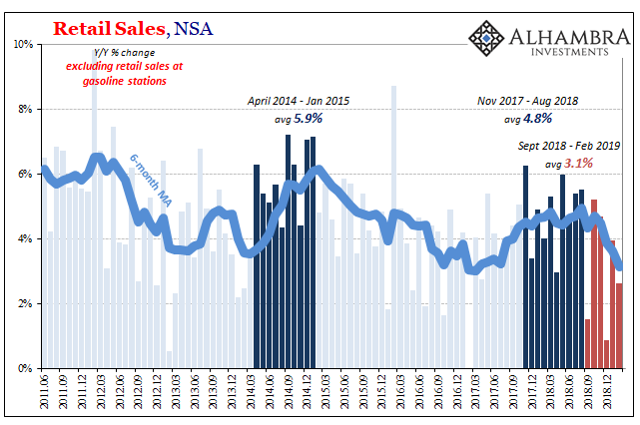 One of the first post-shutdown reports was a truly upsetting setback in retail sales for December 2018, the very height of the retail industry's business calendar. Those numbers were then revised lower still, followed by a modest rebound in January 2019 which are now revised upward. 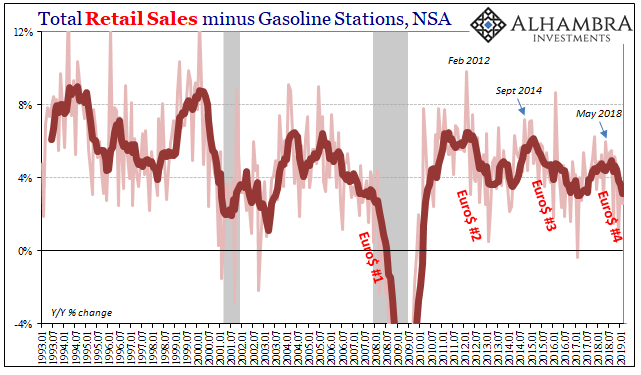 And while gasoline and oil prices have certainly made their mark during this deceleration, the slump is broad-based. 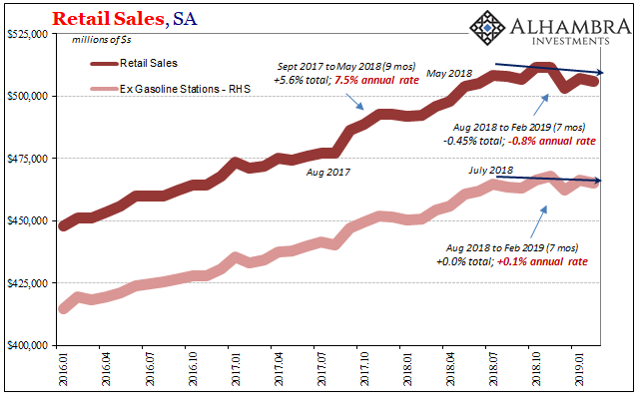 Excluding retail sales recorded by gasoline stations in February, consumer retail spending increased by just 2.6% year over year. 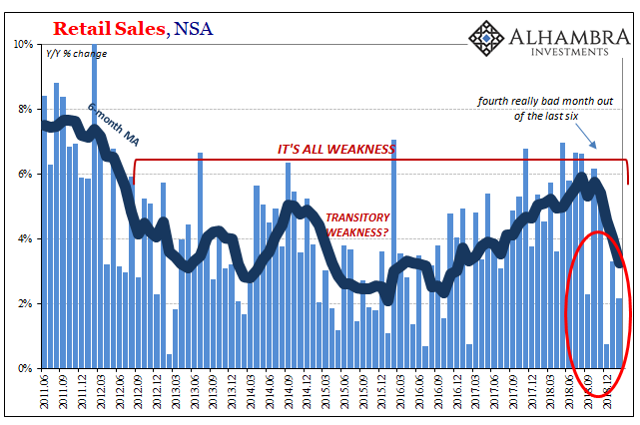 The weakness is apparent no matter oil prices. That's a nine-month slump, seven-month contraction, which is plenty long enough for any statistical doubts to have been satisfied. And since it shows up with and without gasoline sales, this not merely a function of WTI. The numbers are pretty stark, particularly these last seven months (through February 2019) dating back to August 2018 (it wasn't hurricanes after all). 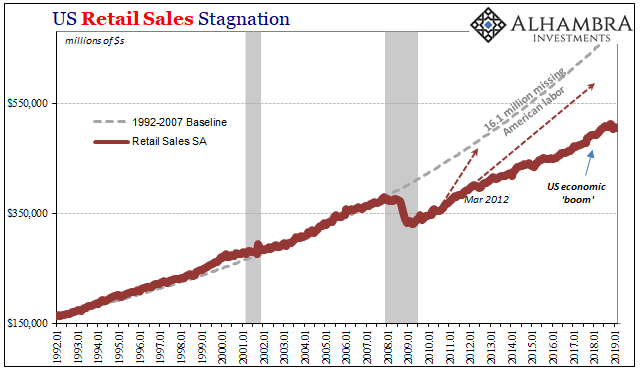 Seasonally adjusted retail sales in February were 0.5% less than they were last July. That's an annual rate of -0.8%, which is much worse than it sounds. 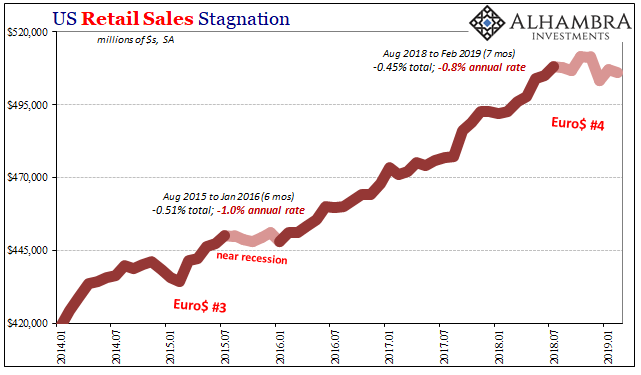 It's already one month longer and about the same depth as the second phase of Euro$ #3, the one beginning August 2015 (CNY plunge) that would push the US economy to the precipice of recession. Stocks are trading as if this renewed (surely) coordinated central bank dovishness will prove effective; though the entire global economy hit a landmine during that particular window, disappointing to be sure, for the optimistic-minded it's all in the past. Conditions will only improve from here now that monetary policies are favorable again. The Fed broke it; they've now fixed the error so nothing more to be worried about. The bond market, and eurodollar futures, isn't so sure. First of all, it was this view which had prevailed in the debate over global growth in the second half of last year. Seeing the Fed taking things a step further, several rate cuts on horizon, this would require more than just what's already been recorded on the downside. To get Jay Powell to complete the entire U-turn, domestic weakness will have to be more substantial still (policymakers really do require a robust slap in the face, as December proved just to get to this Fed "pause"). Well, we have our answer. The government shutdown had the practical effect of stringing along the US decoupling a little bit longer at least in its narrative format. Now that decoupling has been shown once more to be a silly idea, the window shifts toward globally synchronized downturn. Bonds are of the opinion this isn't good no matter what, while stocks are betting it is already past tense.